Alice Miranda At Sea by Jacqueline Harvey. An Alice-Miranda Book. Review: Oh no! On board the Octavia, jewel thieves threaten to turn a grand wedding party into havoc. Alice-Miranda and her friends are determined to find out what's going on. Join them in this intense mystery by reading Alice-Miranda At Sea by Jacqueline Harvey. In this story, Alice-Miranda's aunt Charlotte is getting married to famous movie star Lawrence Ridley on a fancy yacht called the Octavia. It's a weeklong trip and Alice-Miranda has brought some friends and makes a few new ones. The Queen is on board because Alice-Miranda's grandmother is her best friend, but even with the very high security, there are rumors of stolen jewels. In addition, bad storms make this trip even more difficult. Read this astonishing book to see the outcome! The setting, aboard a royal ship, makes this mystery book intriguing because there is stormy weather that causes the boat to move violently from side to side. This creates drama in the story. There is also a lot of suspicion from the kids of the jewel thieves, and even a few minor injuries. So, at first it's just joyfulness in the atmosphere, but later in the story it becomes chaos due to the weather and jewel thieves. All of these bizarre events will have you reading longer and pondering what will happen next. I recommend this book to girls who are 7-11 years old because the words are easy to read for that age and the main character is Alice-Miranda, who is almost 8 years old. Her two friends, Millie and Jacinta, are joining her, too. However, there are a few boys in this story, including Alice-Miranda's new cousin Lucas and his friend Sep. In summary, Alice-Miranda At Sea by Jacqueline Harvey is an appealing read, with the dramatic events and mystery. Wait- Where are my new diamond earrings? We would like to thank Random House for providing a copy of Alice Miranda At Sea for this review. 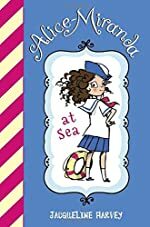 Have you read Alice Miranda At Sea? How would you rate it?